In the spring of 2014, I committed to reading the bible from cover to cover, and to make it a little more fun, invited my fellow HAAM members to read along with me. Between June 2014 and November 2015, we read the entire standard Protestant Bible, examining it as a work of literary and historical significance, rather than a sacred text. 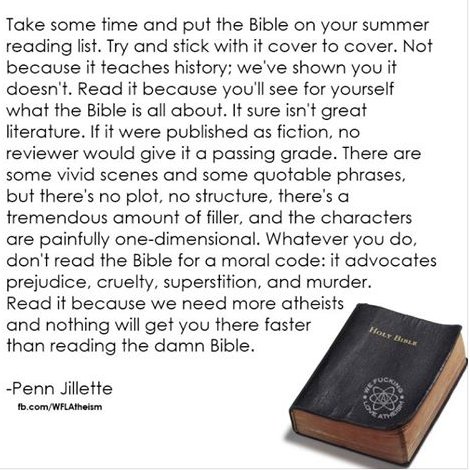 During that time, we posted comments and opinions about the chapters we were reading in the Atheist Bible Study Facebook group , where all the posts can still be viewed. 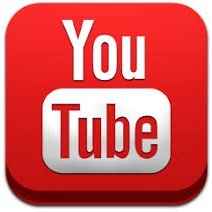 As facilitator, I posted daily and saved all my notes, which will be archived here. If you missed the bible study at the time, or started with us but got behind, or gave up part way through, here is your chance to begin reading now or catch up at your leisure. I wish I could have archived all the comments from the participants as well, but that would have been impossible. However, for now, the Facebook group remains active, so you can still join it if you want, or just read the posts (it’s an open group). And if you scroll down the Facebook page (and keep scrolling… and scrolling) you can read the contributions of our group members all the way back to the beginning. We followed a ‘read the bible in one year’ reading guide, spread out over almost 18 months to allow more time to keep up. There are 369 daily readings (I added 4 extra days for Revelation because it was so complicated), along with additional info, trivia, quizzes, and other comments about the reading assignments. The whole project has been archived here in 18 parts, and for each part, I prepared a short introduction. 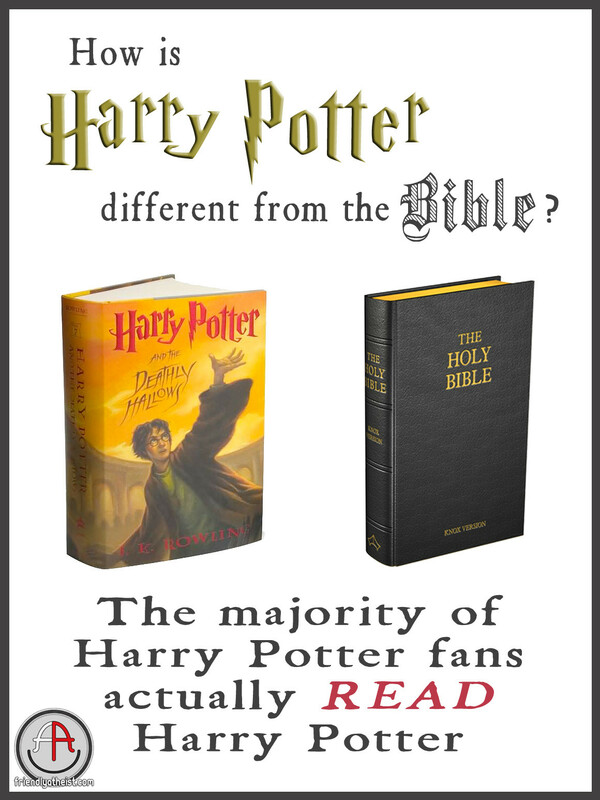 Why did I want to read the whole bible? 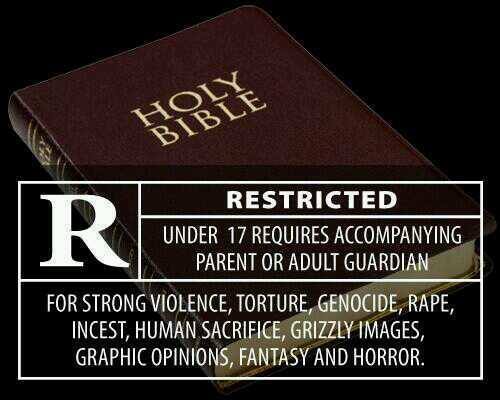 Liberal Christians are often accused of “cherry-picking the bible”. This is the practice of many denominations who like to read only the nice parts of the bible and ignore the nasty stuff. It’s how I managed to attend church regularly for about 30 years and think the bible was ‘The Good Book’ while having NO IDEA what was really in it. The church I grew up in follows the Revised Common Lectionary – a standard reading schedule widely used by Catholic, Anglican/Episcopalian, Presbyterian/United, Methodist, and other Protestant churches. 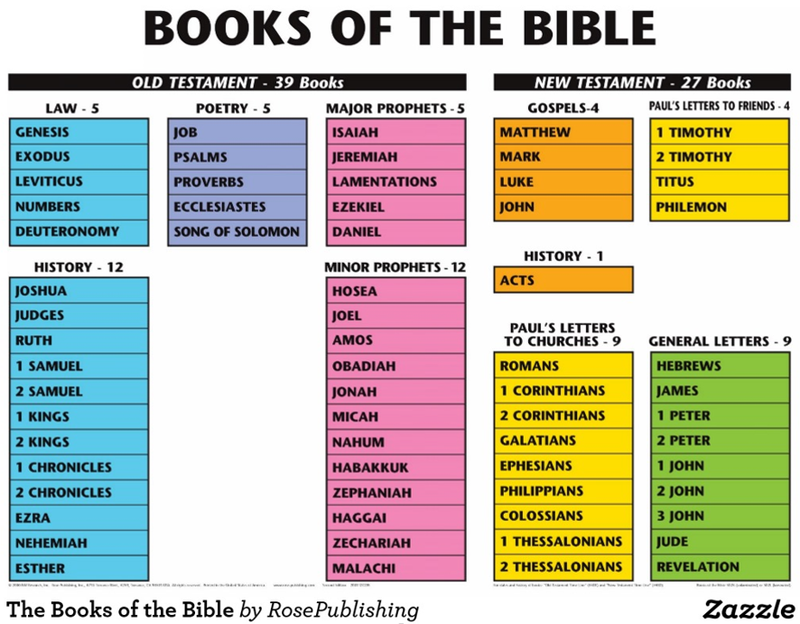 It provides 4 readings for each Sunday service – one each from the OT, the book of Psalms, the Gospels, and the Epistles; therefore half are from the NT and only 1 of 4 is from the OT (other than Psalms). If you attend a church that follows this lectionary, then even if you attend every week, you will only hear 52 short (<5 min) readings from the OT per year, although it comprises 3/4 of the bible. The reading list follows a 3 year cycle and then repeats, so that makes 156 readings, or less than 13 hours of readings from the OT over 3 YEARS! Unless of course you read on your own… Here are the readings from Year A. Notice how they jump all over – only a few verses of each chapter at a time. Take a minute to look at some of the selections for the various church seasons (from the column at the left). If you mouse over a reading, the text will pop up. You will quickly see just how ‘cherry-picked’ the selections are. And that’s why, after leaving the church, I decided to read the whole thing and find out for myself what’s in the rest of the book. 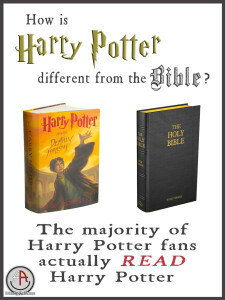 People with all levels of biblical knowledge and education are welcome to follow this bible study; however our target audiences were 1) those with little or NO knowledge and who have not read much or any of the Bible before, and 2) those who have left Christianity and want to re-read it for the first time as a non-believer. Reading with fresh eyes as a skeptic provides quite a different perspective. 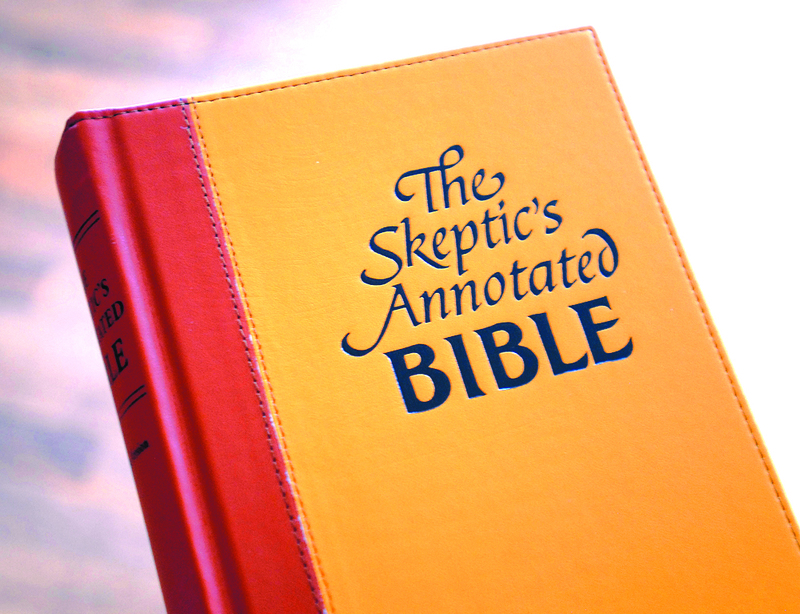 • The Skeptic’s Annotated Bible, (SAB) by Steve Wells. It is available in print form as well as online, but searching and cross-referencing are easier online. This is a complete King James Version (KJV) with margin notes detailing contradictions, scientific errors, absurdities, and instances of violence, misogyny, injustice, etc. It is an invaluable resource. I read the annotations all the way through the bible, and often they covered many or all the points worth commenting on for that chapter. 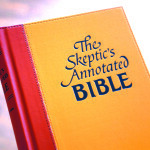 When writing my daily posts, I assumed that bible study participants were also reading the SAB, and therefore did not duplicate the annotations or comment further unless I found a particular point especially important or otherwise egregious. • The New International Version (NIV). This translation also uses clear, modern English, but it sticks a little closer to the ‘original’ KJV and doesn’t sanitize the politically incorrect language as much. • Occasionally, when seeking ‘another opinion’ on interpretation, I also used the New English Translation (NET) for comparison. There are many online bible websites; find one that’s comfortable to read. Two of the biggest are Bible Gateway and Bible Hub. I read from the Bible Gateway site because it allows one to view multiple versions on the screen simultaneously, like this. 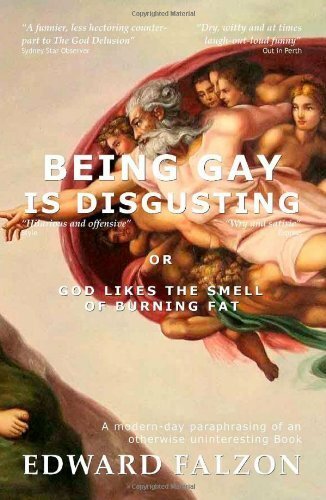 • Being Gay is Disgusting, by Edward Falzon, is a very entertaining, colloquial paraphrasing of the Pentateuch (the first 5 books of the Old Testament). I read it alongside the actual bible, and it really helped for those first few months. When I quote Edward in my notes, it is from this book. Edward visited Winnipeg on a book tour shortly after it was published, and a group of HAAM members had the pleasure of meeting him and hearing him speak about his book. He also kindly donated several copies to our group and they are available for sale at $15 each. If you would like to buy one, please contact us. Edward is hoping to paraphrase more of the bible, particularly the New Testament, so watch for forthcoming books. I would like to thank my fellow members of the HAAM executive who supported this project. And of course the many, many readers who shared the journey with me all the way through this awful book. Their comments and ‘likes’ made it so much more enjoyable, and many provided additional information, corrections, suggestions, or humor. I don’t know if I would have completed this project without all the encouragement and support; not to mention needing the incentive to keep up with the reading schedule. Many times I became bogged down in the more confusing, depressing, or disgusting passages, and a few times almost gave up, but knowing that readers were expecting my posts on the next day’s reading kept me on track. What doesn’t kill you makes you stronger.